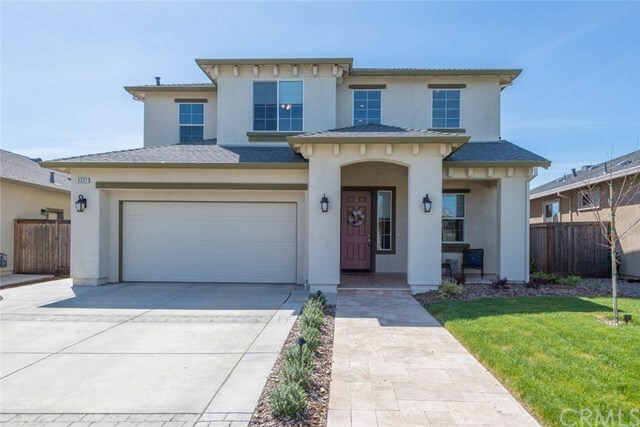 Large pristine home w/ great floor plan and beautiful finishes throughout! As good as or better than new construction, this home feels brand new and shows like a builderâs model. Located on one of the best streets on the north side of Chico, youâll notice pride of ownership not only thru-out this home but among the neighboring properties. What makes this property special is the $38k in builder upgrades, $45k in newly installed professional landscaping, pavers and pergola, 18 owned solar panels and high-end window treatments. The floor plan canât be beat w/ the downstairs providing many living or entertaining spaces. A formal living or dining at the entry, a bonus room w/ closet that could make for a 5th bedroom as there is a full bathroom across the hall or just a great office or play room w/ glass French doors. The spacious gourmet kitchen includes tons of storage, island, butlers pantry and stainless steel appliances. Another dining area sits between the kitchen and great room where youâll find a gas fireplace. The large master suite is truly a retreat w/ a large walk-in closet and spacious bathroom w/ soaking tub, separate shower and double sinks. The 3 other bedrooms and larger than normal guest bathroom are also upstairs along w/ the laundry room. The backyard is stunning w/ a stone paved patio, massive pergola with electricity, fruit trees, privacy laurels, etc. Great location w/ easy access to the freeway, DeGarmo park, restaurants, wine and tap room and coffee shops.